Africa became an island during the Cretaceous: how did this affect the dinosaurs? Following fragmentation of the supercontinent Pangaea, Africa remained linked to South America and other southern hemisphere land masses through most of the Early Cretaceous (see Figure 8.2). Madagascar broke away from the main African land mass by 120 Myr ago and South America followed by 100 Myr ago. A major marine transgression about 95 Myr ago then flooded most of North Africa and the Sahara, forming a seaway that extended from Algeria southwards across the Sahara, separating the north-western portion of Africa from the rest of the continent. Late Jurassic dinosaurs from Africa are best known from Tendaguru in Tanzania. The Tendaguru fauna is very like that of the Morrison Formation in the mid-central USA, even sharing genera such as the theropod Ceratosaurus, the sauropods Barosaurusand Brachiosaurusand the ornithopod Dryosaurus. Dinosaurs from the middle of the Cretaceous of North Africa show similarities with those from South America and with Euramerica (Sereno et al., 1996, 1998). For example, the spin-osaurid theropod Suchomimus from Niger (see Figure 8.5(c)) is virtually indistinguishable from Baryonyx from England and Irritator from Brazil. 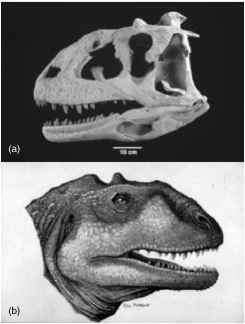 Likewise, the carcharodontosaurid Carcharodontosaurus from Morocco (see Figure 8.5(d)) is similar to Giganotosaurus from Argentina and Acrocanthosaurus from North America. Cretaceous of Madagascar include the abelisauroid theropods Majungatholus and Masiakasaurus, both of which had close relatives in South America (see Figure 8.4(d)). Sauropods include the titanosaurid Rapetosaurus (Curry Rogers and Forster, 2001). The abelisauroid dinosaurs, together with members of other groups (e.g., mammals and crocodiles), suggest close faunal links between South America and India-Madagascar, perhaps indicating a dispersal route via Antarctica (Sampson et al., 1997, 2001). This idea remains to be tested by future discoveries, particularly from the Upper Cretaceous of Africa. Read more about Scott Sampson and his work on Madagascar at http://www.vertpaleo.org/education/SpeakerOfTheYear.html and at http://www.umnh.utah.edu/museum/departments/ paleontology/paleostaff_scottsampson-currentproj.html, as well as a review of the new discoveries at http://www.timeforkids.com/ TFK/magazines/story/0,6277,97951,00.html. mass to leg muscles, which is clearly impossible. With its leg muscle volume, T rex could have achieved a fast walk at 11ms-1 (40kmh-1 or 25 m.p.h. ),but not the wilder speeds of 72 km h-1 that have been suggested. Struthiomimus could have run fast and speeds of 3560 km h-1 have been estimated. 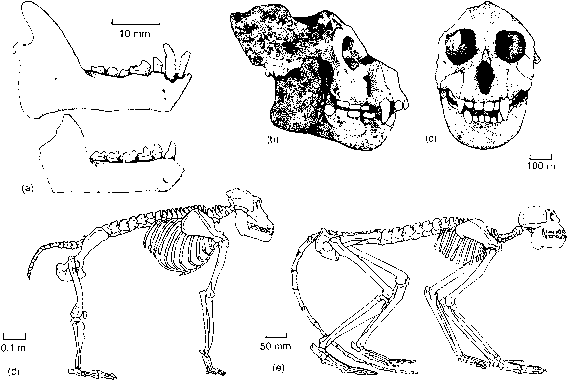 The skull is completely toothless in later forms (Figure 8.6(e)) and the or-nithomimid diet may have included small prey animals such as lizards or mammals, or even plants. Well preserved specimens (Norell et al., 2001) show that the toothless jaws were covered by a keratinous beak that bore vertical ridges inside the jaws, similar to those in ducks, used perhaps in the same way for straining small animals, or even plant material, from pond water. The most derived theropods, the Maniraptora (see Box 8.5), include the alvarezsaurids, therizinosaurids, troodontids, dromaeosaurids and birds. The contents of this clade are, however, somewhat controversial: Gauthier (1986) identified the dromaeosaurids and troodontids as close relatives of birds and forming the clade Maniraptora. Alvarezsaurids were until recently, however, classed as birds, whereas therizinosaurids were often hard to place. 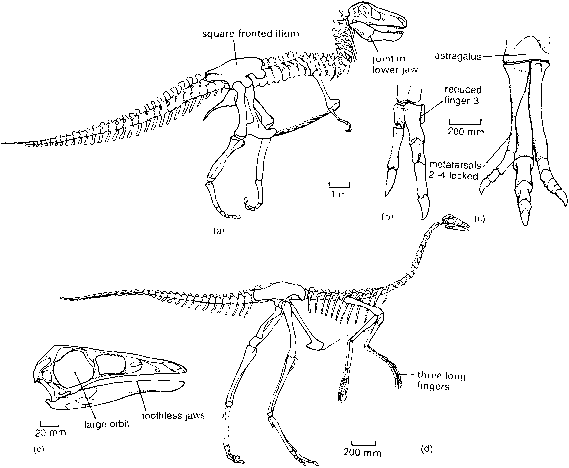 Oviraptorosaurs, still regarded as dinosaurian maniraptorans by many(e.g. Clark et al., 2002), have been assigned to birds by Maryariska et al. (2002) and they will be treated in Chapter 9. 2 and 3. The function of this extraordinary little arm is a mystery. Perhaps it was used for scraping and tearing plant food, or for opening termite mounds, but the arms seem to be ridiculously short for such an activity: Mononykus would have toppled over if it bent down to use its arms on the ground, and they certainly could not have reached the mouth. The therizinosaurids, such as Alxasaurus (Figure 8.7(c)) from Mongolia and China, were the most bizarre theropods of all. Their affinities were for a long time problematic, having been identified as turtles, theropods, or something between saurischians and or-nithischians. They were large animals, 4-5 m long, with a massive pelvis and short tail. The forelimbs are long and the hands and claws extremely elongated. The neck is powerful, but the skull is small and equipped with apparently rather feeble peg-like teeth and a toothless beak at the front. Russell and Dong (1993) suggested that the therizinosaurids were foliage-eaters, rather like certain mammals, the chalicotheres and giant ground sloths (see pp. 317, 348). Therizinosaurus sat balanced tripodally by its massive pelvis and short tail and raked in tree branches with its long slender claws, which it passed to its toothless beak. The troodontids from the Upper Cretaceous of North America and Mongolia, such as Saurornithoides, had long slender skulls (Figure 8.7(d)) with the orbits facing partly forwards so that they may have had binocular vision (Russell, 1969). The braincase is bulbous and relatively large, which has led to the interpretation ofthe troodontids as the most intelligent (or least stupid?) dinosaurs. The foot (Figure 8.7(e)) has three functional toes, of which number 3 is the longest, a bird-like structure designed for fast running. The dromaeosaurids, a family of six or seven genera from the Cretaceous of North America, Mongolia and China, have also been identified elsewhere on the basis of isolated teeth. The best known dromaeosaurid is Deinonychus from the Lower Cretaceous of North America (Ostrom, 1969), a small animal about 3m long, 1m tall and weighing 60-75 kg (Figure 8.8). The skull is incompletely known. The curved sharp teeth have serrated edges, as in all other theropods, which were presumably as effective in cutting flesh as a steak knife. Deinonychus held its backbone roughly horizontal when it was moving. At one time, bipedal dinosaurs were reconstructed in kangaroo mode, with the backbone sloping or close to vertical. There are three lines of evidence that Deinonychus and others adopted the posture shown here: (1) it allows the body weight to balance correctly with the centre of gravity over the hips; (2) the joints between the cervical vertebrae show that the neck curved up in a swan-like S-shape; and (3) the dorsal vertebrae bear scars on the front and back of the neural spines that are like those which in flightless birds such as the ostrich prevent flexing of the back. The tail acted as a stiff rod, probably in balancing. It is invested on all sides by stiff bony rods formed above from the prezy-gapophyses, normally a pair of short processes in front of the neural spine that interlock with the postzygapophyses of the vertebra in front, and below by the chevrons, separate bony elements that normally run back and down a short distance and provide attachment sites for the tail muscles. 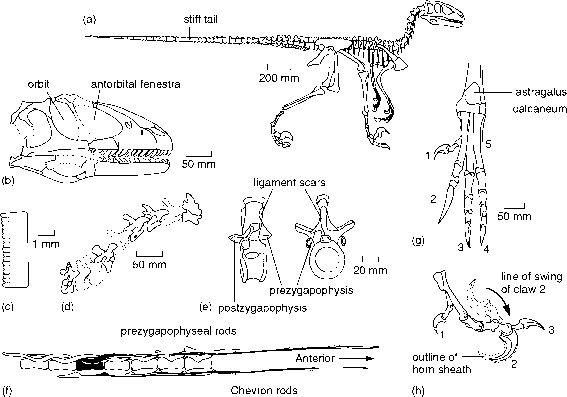 In Deinonychus, the prezygapophyses and chevrons have unusually long anterior rods, probably formed from ossified tendons that intertwine above and below the vertebrae. These rods did not entirely immobilize the tail because they remain separate and could slide across each other to some extent. The arms are strong and the hands armed with deep claws on the three long fingers. Indeed, the hand is nearly half the length of the arm, a bird-like feature. The wrist of Deinonychus is unusually mobile and the hands could be turned in towards each other. The hand was clearly used for grasping prey and the claws for tearing at flesh. his insight that Deinonychus was an active biped like a modern flightless bird that could balance readily on a single foot. The toe claw is ideal for disembowelling prey. Deinonychus (literally 'terrible claw') ran up to its victim with the claw held up to keep it from scraping on the ground, raised one foot, balanced and slashed with a backwards kick at its flanks, causing a deep gash up to 1m long. The most likely prey for Deinonychus seems to be Tenontosaurus, a fairly abundant relative of Hypsilophodon (see pp. 206-7), that reached 6-7m in length. Deinonychus may have hunted in packs like certain wild dogs today, which would have enabled it to harry and weaken much larger prey animals before killing them with fatal slashes to the belly region. The tiny dromaeosaurid Microraptor from the Lower Cretaceous of China (Xu et al., 2003) is so well preserved that it shows feathers. There are rows of 'flight feathers' (see Box 8.2) behind the arm bones,but also attached along the hindlimb. Microraptor could not fly—the 'wings' are not large enough to support its body weight, but Xu et al. (2003) argue that it might have glided with all four limbs outstretched.